The place where Karate training is carried out is called the “dojo”. This translates to “the place of the way”. The traditional white uniform you wear in the dojo is called a “gi”, simply meaning “uniform” in Japanese. The loud yell made during explosive techniques is called a “kiai” (key-i). This is Japanese for “unification of will”. The kiai serves two purposes, to empty the body of excess wind incase you are hit in the stomach by a counter attack and to focus all positive energy (“chi”) on the technique. Contrary to popular opinion, the martial art Karate was not invented in China. Rather, it has its origins in the island of Okinawa in Japan. The word "Karate" means the "empty hand" or the "Chinese hand", and it has been given this name because it involves a rapid use of hands and legs in an extreme close combat. It was sometime in the sixteenth century that Chinese Kung Fu fighters experimented around with their styles and formulated the "te" technique ("Te" means hand). The art grew in China and evolved from a very rough and simple fighting style into a hard, close-combat style. Around the late nineteenth century, Gichin Funakoshi, a famous martial arts practitioner from Japan, blended new moves into the "Te" style and displayed his art to the Japanese martial arts masters in early twentieth century. This was the beginning of Karate, as we know it. 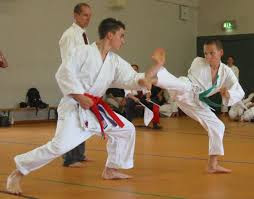 Karate kicked off with the original Okinawa style; later on, the Japanese patented their own styles, which are now appropriately called Japanese styles of Karate. With time, many karate schools all cross the world began naming their Karate after their school's or master's name, giving birth to many sub-styles. The original style - known as the Okinawa style - is a very hard and external style. It employs circular means of defense while its attack is linear in nature. The physical condition is extremely rigorous, as compared to the Japanese style of Karate. The Japanese style of Karate is more stylistic and its movements are linear in both defense and offense. Karate is one of the most popular martial arts practiced today. are in when you start. Karate is a way to a better life, not just a method of fighting. Karate is great for the mind (concentration) and the spirit (emotional stability). As recently as a hundred years ago, it was common practice for karatekas to intentionally break one or both of their middle fingers early on in their karate training. This increased the size of the middle knuckle, making it a more effective punching weapon.